Lake Tarawera, meaning 'Burnt Spear' is one of the largest lakes in New Zealand. The lake was home to many small Māori villages and mission settlements,until the Tarawera eruption in 1886. Legend has it that a "waka wairua" (phantom canoe) appeared on the lake as a portent of death a few days prior to the eruption. 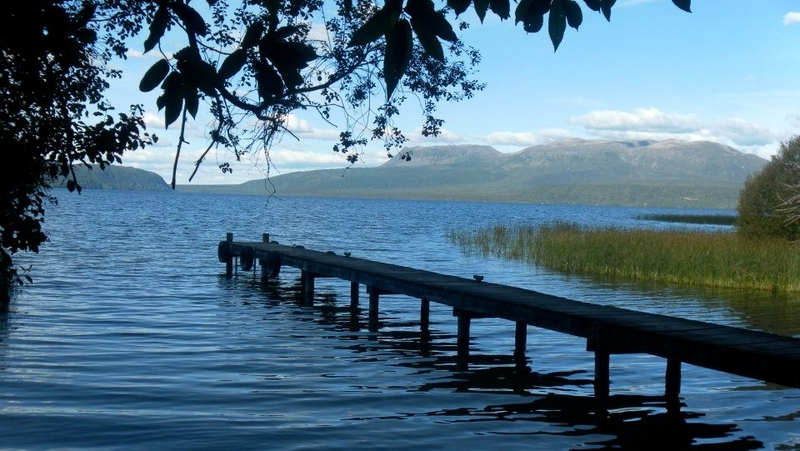 Lake Tarawera is a picturesque lake, famous for the size and condition of its rainbow trout. Several lakes in the area drain into it directly or via groundwater, along with geothermal springs on the southern and northern shores. Lake Tarawera is a deep clear lake providing top-quality fishing for trophy size fish in a pristine environment. This lake is one of the most highly regarded fisheries in the country due to its beauty and the number and size of the fish it regularly produces. Surface outflow via the Tarawera river. Lake Tarawera, situated under the now dormant Mount Tarawera, is one of the most remote and beautiful lakes within the Rotorua system. Lake Tarawera is a pristine lake surrounded by a ring of hills and dominated by the mass of Mount Tarawera. In 1886 Mount Tarawera erupted, destroying most of the native bush around the lake. Consequently, the lake is now ringed by secondary growth bush and scrub. The water in the lake is deep, very clear and very cold providing excellent trout habitat. Of all North Island regions, the Rotorua lakes are regarded as the closest in New Zealand to having a continental climate with hot, mostly dry summers and cool wetter winters. As trout have an abundant food source within the lake they grow rapidly and reach some of the most impressive sizes of any trout in New Zealand or indeed the world. While most of the fishing on this lake is necessarily done with a boat there are also some excellent opportunities for the shore-based angler around the western bays where there is road access. Boats are often used by anglers to reach some of the remote and isolated bays where the fishing can be superb and undisturbed by other anglers. Some favoured spots include the Te Wairoa stream mouth, the Landing, Rangiuru Bay and Waitangi Bay. The opening morning of any new season is a time of celebration with many anglers descending on the lake for a "dram" prior to the 5 a.m. official start. Lake Tarawera holds impressive numbers of very large rainbow trout, many of which reach and exceed that magical 10 pound (4.5 kg) mark. Fish over 6kg are also regularly caught. Lake Tarawera is approximately 18 km from Rotorua township and can be reached by taking the Tarawera Road that leads off State Highway 30 at the southern end of Lake Rotorua. This road allows access to the western shoreline and to a number of boat ramps. Most of the lake however is only accessible by boat. On the western shoreline there are a number of very popular fly fishing spots. While these areas can fish well during the day they come into their own at change of light or at night. As the water is deep even close to the shore a sinking line is best during the day though a low to medium sinking line is better in the evening or on a dark night. Trolling remains the most popular method of fishing this lake, particularly during the warmer months when the trout go deep. This requires however the use of lead core line or a downrigger to get the lures to the correct depth. Jigging is also becoming very popular and successful. For trolling, over 100 metres of lead core line or a suitable downrigger capable of getting the lures down 20 to 30 metres is required. To jig this lake use either non-stretch nylon or the new fusion lines as these allow the soft takes of the fish to be felt more easily. A fish finder will help establish the depth of the fish. When fly fishing from the shore during the day use a fast sinking line and a slow to medium sinking line in the evening or at night. Dry flies: Lake Tarawera is not noted as a dry fly lake but during the warmer months Cicada, Blowfly and Wasp patterns can be effective when these insects are being blown onto the water. Nymphs: Lightly weighted Hare and Copper, Pheasants Tail and Halfback nymphs can be effective when fished on a floating line close to the shoreline. The "heave and leave” method with a Glow Bug is also popular when fishing from the shoreline in the evening or at night. Wet flies / Streamers: Red Setter, Hamill's Killer, Green Rabbit and Parsons' Glory all work well during the day, and darker patterns such as Scotch Poacher, Fuzzy Wuzzy and Craig's Night-time at night. Spinners: Black Toby, Tasmanian Devils, Flat Fish and Cobras all work well. There are a number of small streams that flow into Lake Tarawera, all of which provide excellent fishing at their mouths. At the eastern end of the lake the Tarawera River flows out. Note that many of the streams that flow into the lake are permanently closed to all fishing (see the regulations). Applicable to: Lake Tarawera within the section of Rangiuru Bay defined by landmarks at Stoney Point and Kariri Point and extending 200m offshore. Methods: Fishing from an unanchored boat is prohibited. Size limit (cm): 350mm minimum for all trout and 650mm maximum for wild rainbow trout. Applicable to: Tarawera Outlet Spawning Sanctuary. Methods: None. No boats are allowed to pass through the spawning sanctuary at any time. Applicable to: All streams flowing into Lake Tarawera and that portion of the Tarawera River enclosed by landmarks at the Lake Tarawera Outlet and extending approximately 150m downstream to landmarks in the river, otherwise known as the Tarawera Outlet Spawning Sanctuary. Methods: None. No boats are allowed to pass through the Tarawera Outlet Spawning Sanctuary at any time. Applicable to: Lake Tarawera within 200m of the Te Wairoa Stream mouth. Fishing from an unanchored boat is prohibited. Applicable to: Lake Tarawera within 200m of the mouths of Wairua Stream, Twin Creeks and the Tarawera Outlet. Applicable to: Lake Tarawera winter shoreline area from Tarawera Outlet landmark to Te Tapahoro Bay landmark and 200m offshore. 1 Jul-30 Sept: Fishing for trout from a boat is prohibited. Applicable to: Lake Tarawera within 200m of the Orchard, the Landing and Waitangi Stream mouths. Methods: Fly fishing only. Fishing for trout from an unanchored boat is prohibited. Applicable to: Lake Tarawera within 200m of the Otumutu Lagoon Streams.